Donna is a Certified Avian Specialist (CAS) also trained in Pet CPR and first aid who has owned parrots for 38 years. She has worked in an avian veterinary hospital for over 14 years and currently assists with avian microsurgical procedures two-three times per week, making her very observant and knowledgeable about symptoms of illness. All staff are directly supervised with her on-site and currently consist of a CAS-certified manager and boarding assistant with a combined 12 years’ experience at birdStuff™. Solid walls and back create a sense of security, especially good for nervous birds or first-time boarders. Birds are comfortable enough to eat and rest from the first day of their stay. Birds perceive solid acrylic door as a safe barrier yet do not feel confined since they can see out and are completely protected from accidental bites from other birds. Solid, smooth surfaces can be completely disinfected between guests and white bottom paper allows for inspection of food consumption and monitoring of droppings. Birds from the same household can be placed across from each other to face each other. South American species in New World Room (notice how the birds are unconcerned by their "neighbors" and completely secure) Also note pet records on each door; your bird's medical history, diet, preferences and other information are stored in our database, and weights are recorded here daily. No bird at birdStuff™ is stuck in a cage all day. Birds come out to exercise on a stand for a minimum of 15 minutes twice a day. Most birds use this time to preen and stretch. Even flighted birds can come out safely since the acrylic doors protect them from the other birds. If you wish for your bird to have additional time out, it is available for an additional fee. In addition to your bird’s regular diet, he will receive warm, cooked vegetables at lunchtime. If you would like him to have other vegetables that you bring or want him to sample the “Crazy Corn du Jour” that is an available option. 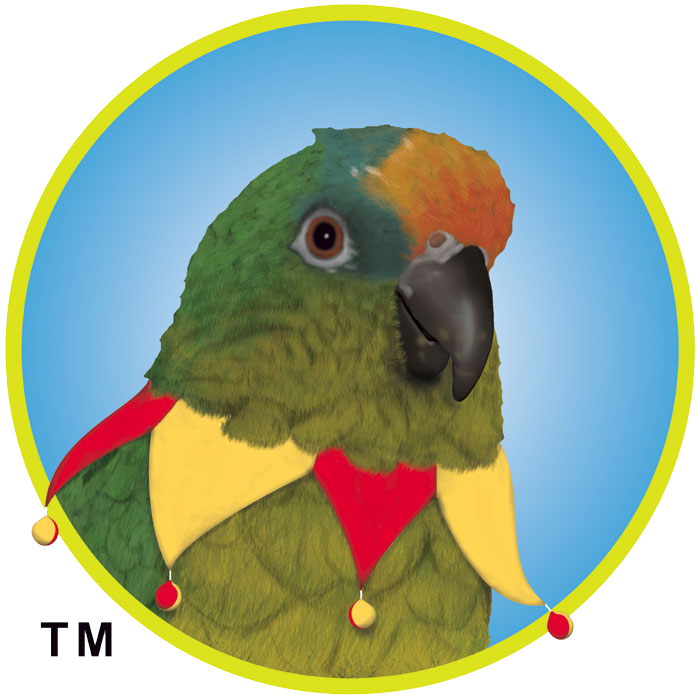 birdStuff™ employs several levels of air filtration for the health of your bird. 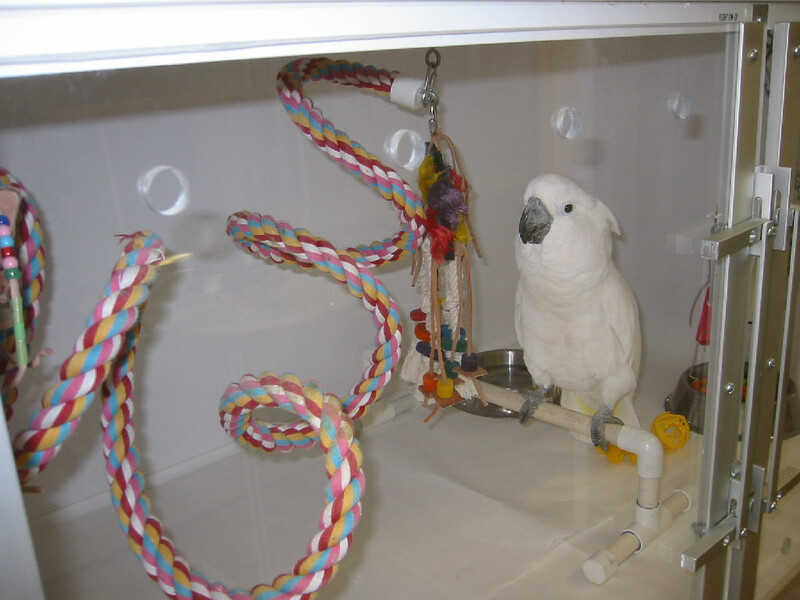 First, the "dusty" Old World birds (such as Cockatoos, cockatiels, and African Greys) are kept in a different room than the New World species (conures, Amazons, etc) which may be sensitive to the dust. Secondly, each room contains a high-efficiency HEPA air purifier running 24 hours, and each room as well as the retail area is on a separate HVAC system. All rooms are ventilated to the outside, with no recirculated air. Thirdly, the building’s primary filters are changed twice-monthly as a backup and also use HEPA filters. The water supply is filtered via a two phase filter system prior to entry into the building. This process removes sediment, macrominerals, chlorine, heavy metals, pesticides, herbicides, carcinogens and other contaminants. There is no need to bring water for your bird when he stays. Every cage is cleaned daily using an avian veterinary disinfectant called Avinol, (available for purchase at birdStuff™ ) that kills a broad spectrum of avian pathogens, including molds, bacteria, viruses and fungi. Stainless steel dishes and PVC perches are sterilized in the hot water cycle of the dishwasher. Every bird is weighed in grams upon arrival, and again each day before breakfast and weights recorded on its chart. Diets are adjusted based on weight if necessary. Donna is a Certified Avian Specialist and has trained as a veterinary assistant and is proficient in giving oral and injectable medications if your bird is under treatment for a non-contagious illness. When you drop your bird off for boarding, you will be asked to sign a statement that you have not exposed your bird to other untested birds since having your bird tested for disease, and you will be asked to direct us in the case of a medical emergency. birdStuff™ is adjacent to The BIRD Clinic and our staff has access to Dr. Nemetz 24 hours a day in the event of a medical emergency. This is an assurance you do not have if you leave your birds at home. If you choose your bird can end her visit with a spray bath and sun dry. Birds are heavily sprayed with warm water in a stainless steel cage on our partially covered patio, and dry for 30 minutes in the sun’s rays (cage is partially covered to prevent overheating). We can even teach reluctant birds to enjoy bathing! After the bird has had the above testing, the tests (except for CBC & PVD vaccine) will not have to be repeated if the bird does not come into contact with other birds (boarding, bird marts, etc.) You will need to sign a statement to this fact each time you board. 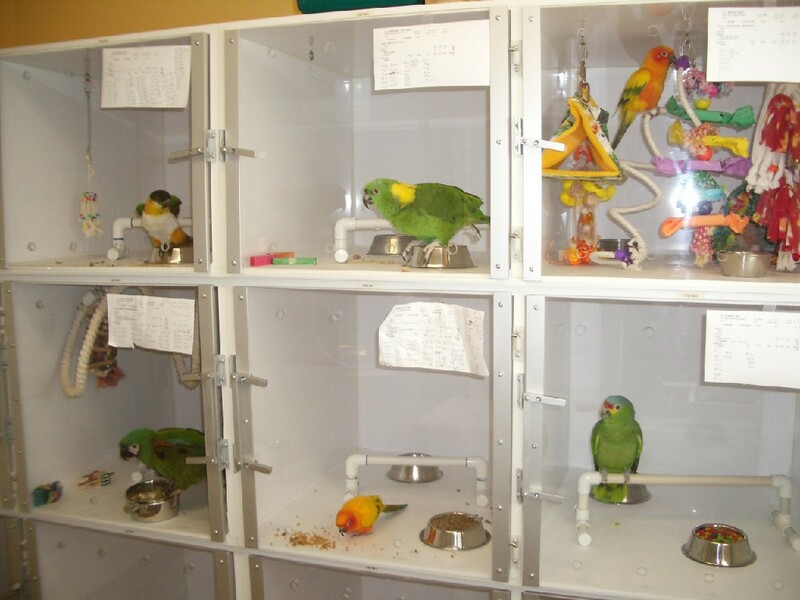 If you have boarded your bird somewhere else, the tests will need to redone if there are birds for sale at the facility or grooming done there, which re-exposes birds to disease directly as well as via products and food. You may reserve a larger enclosure or specific location for your bird if you wish, depending on availability. Large macaw species and Moluccan cockatoos are required to stay in double suites (45” wide) if staying longer than one night. Reservations are required and drop-offs and pick-ups must be made during hours of operation. Please note: Charges are per day, not per night. Daycare (drop off and pick up same day) is charged for one day, but all overnight stays are charged for a minimum of two days regardless of time picked up. Because we may be caring for a large volume of birds, we ask that you take your carrier back with you. We provide individual boxes for each bird's supplies but space can be limited during busy times; therefore we ask that you limit the supplies to a reasonable amount of food and treats (no large buckets or tupperware) and one or two favorite toys for the cage. If you are worried that your bird will go through all his toys, just let us know and we will add something nice for him that he will love. Sometimes you may have to leave your birds for an extended time, such as when remodeling a house or moving. You are welcome to come in and visit your boarding bird during that period, during the hours of 11AM-4 PM. We do not allow visiting during the other hours to give us time to properly care for all the boarders and their needs. Charges will be added during the stay and you will pay upon pickup. The exception to this is long term boarding of more than one month duration. You will be asked to pay for one month in advance, and to provide a credit card for charges to be paid on a monthly basis. We look forward to meeting your feathered kids and having them join us for a while! Contented 'Too in four foot wide suite for room to exercise! Baths are not a luxury, but rather a necessity for your birds. We are happy to give your bird a mid-stay or a take-home bath. What about birds that are averse to baths? We will "train" them to accept baths. Using a very fine spray directed high into the air and away from the face, after a few sessions, even the most reluctant bather will begin to flap and preen when he sees the bottle. For birds accustomed to the bath, we will provide a drenching warm water spray, paying special attention to dirty areas, and allow the bird to dry in a padlocked stainless steel cage on our semi-sun/shade patio. The cage includes a 12 inch diameter stainless bowl that the bird can enter if he/she wants to get into the act (it will be filled with shallow water for smaller birds for safety). A small amount of an appropriate bath spray will be added to the water depending on the bird's needs (for example, dander reducer, shine spray, or molt ease). The time the bird is exposed to the natural ultraviolet rays is also essential to the health of birds, and it is recommended by avian veterinarians that all birds receive at least a 30 minute session weekly in natural light. In cooler weather, birds are gently blown dry. For birds that get really dirty (such as cockatoos with stained feathers) we offer a "sink bath" with a pH balanced coconut-oil based cleanser made especially for birds, which we also carry in the store for occasional home use. For small birds such a cockatiels, that don't tend to their tails well, we provide a soak in lukewarm water that also pays special attention to feet and fluffy bottoms. For our duck friends, we have a 5 foot stainless steel tub for a swimming and bathing experience par excellence. You'll love bringing home a velvet-soft, sweet-smelling bird after a long trip and the convenience of having someone else do the dirty work for you! Look at us glowing now! "My name is Fulton. 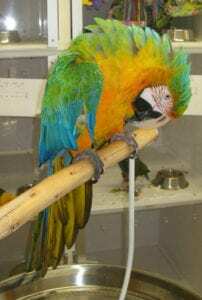 I'm a five year old Severe Macaw. I used to be a nut addict and a feather picker. When my mom went to Greece over the summer she boarded me at Bird Stuff for two months. When she dropped me off with Donna I was taking meds twice a day for anxiety and feather picking. My uric acid levels were very high and my diet was really unhealthy. My mom tried to give me pellets lots of times, but why eat pellets when I could have nuts? I know nuts are bad for me, but I love them. I couldn't help myself and I knew my mom would spoil me and give me what I wanted. Donna was a lot more successful with me. While my mom was away, Donna weighed me every day while she slowly converted me over to Harrison's pellets and veggies. Now I only eat two almonds a day and I have to work hard to find them inside my foraging toy stuffed with nesting material. It's a lot of fun. I also enjoy my pellets and veggies, but I'd do just about anything for my two almonds a day. Donna also helped wean me off of my meds, so I no longer feel sleepy all of the time. I'm so happy not to take that stuff anymore. All of my old raggedy dull feathers have been replaced by beautiful, new, bright, full plumage and I don't feather pick anymore. My uric acid levels are finally normal. I'm back with my mom now and I really missed her. My mom's been good about maintaining my new diet and routine and we're both very grateful to Donna at Bird Stuff and Dr. Nemetz too." "Vacations were always stressful worrying about who was going to watch our macaw, Syrah. Some vacations were even cancelled at the last minute to eliminate the stress. When birdStuff™ opened, our vacations became carefree, knowing that Syrah was getting the best care possible. We tell everyone that she goes to “camp” and she always comes home to us a sweet, loving bird which lets us know that she loves her stay with Donna." "Thank you so much for taking such loving care of my Paco. It sounds like he had a great time "talking" to the other amazons. I appreciate all the effort you have made to ensure the health and safety of our precious winged friends."